After dumping and organizing all your ideas in the nested task list view, it’s time to work on your project! 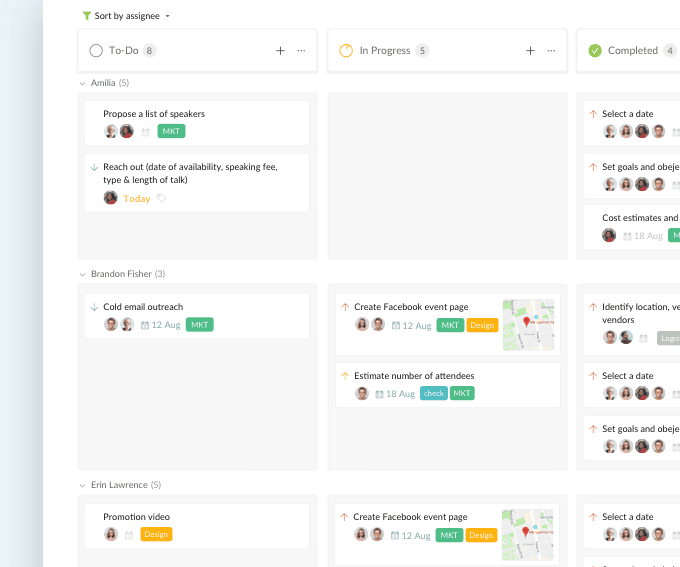 Get focused on selected tasks and visualize your workflow with the Kanban board. After listing out your hundred of tasks for the Children's Run Charity event, now you would like to focus on some crucial tasks at the initial stage. Simply create a board. To add a board, click on the "Add board" button, type in your board name. 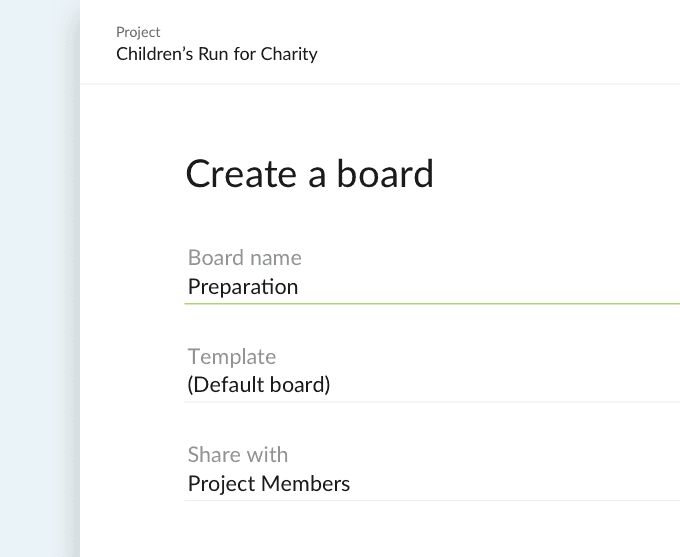 Tip: You could create multiple boards for different stages of your project. Start by adding existing tasks from the task list which you want to focus for this stage. Click on the "+" sign at the top right corner of a column, choose "Add existing tasks". 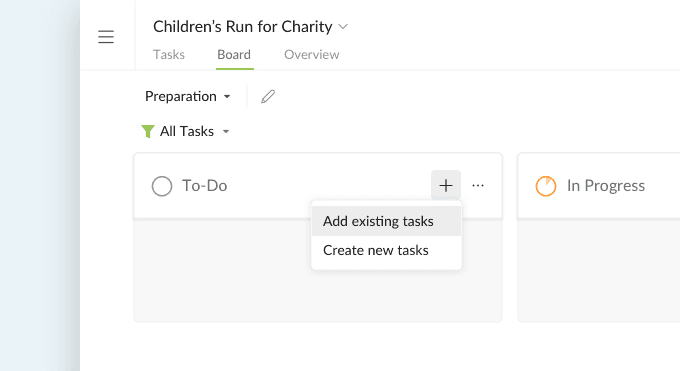 Of course, if you didn't find anything you want to add in the existing tasks, you can create new tasks in the board view. Choose "Create new tasks" instead. 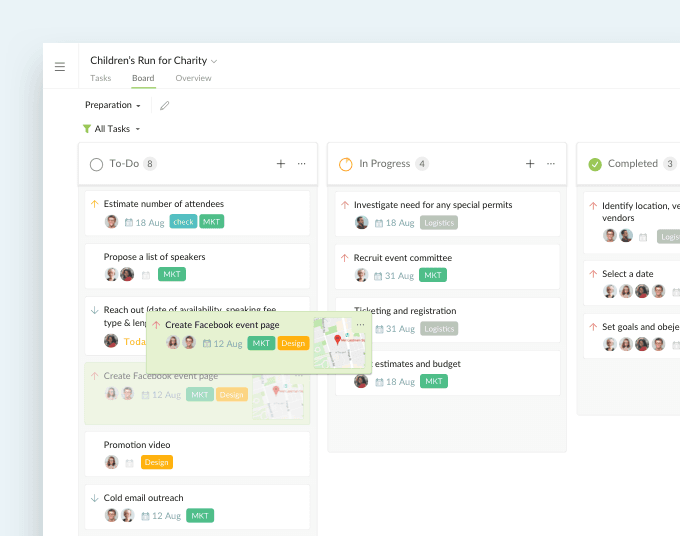 Note: The newly created tasks in Board view will be added in the Task list view as well. Tip: Pressing Ctrl (or Alt on Mac) will show the breadcrumbs, by that you will know which subtask belongs to which parent task. You could add more detailed information by setting start/due dates, assignees, and tags. Click on the "date", "assignee", "tag" icons to set additional information. Tip: By pressing the Spacebar, the detail panel will show up for you to add descriptions, attach files, leave comments, etc. 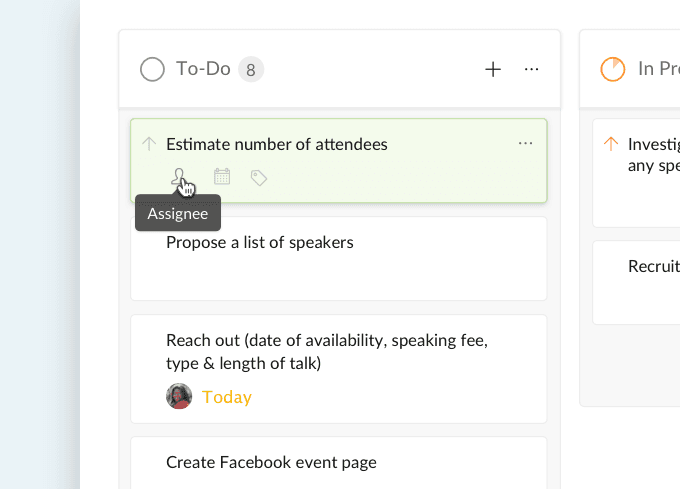 You can reposition tasks in the column for higher priority. Also, you can drag and drop tasks to different columns for progress tracking. Now, you will be able to see the dynamic status of your project at a glance. Feeling like all the tasks are squished into one column and it's getting harder to get a hold of the workload and status of each team member? You can use filter/sort feature to group your tasks by the preferred attributes. For example: grouped by assignees to see each members' responsible tasks. Enter—To add a new task. F2—To edit the task name. Up Arrow—To go to the task above. Down Arrow—To go to the task below. Space—To open the right detail panel. Shift + Up/Down Arrow—To select multiple tasks. Ctrl + A—To select all tasks. Ctrl + Up/Down Arrow—To move tasks up or down. You can right-click on a task, to bring up the context menu to set due date, assignee, tag, and more. 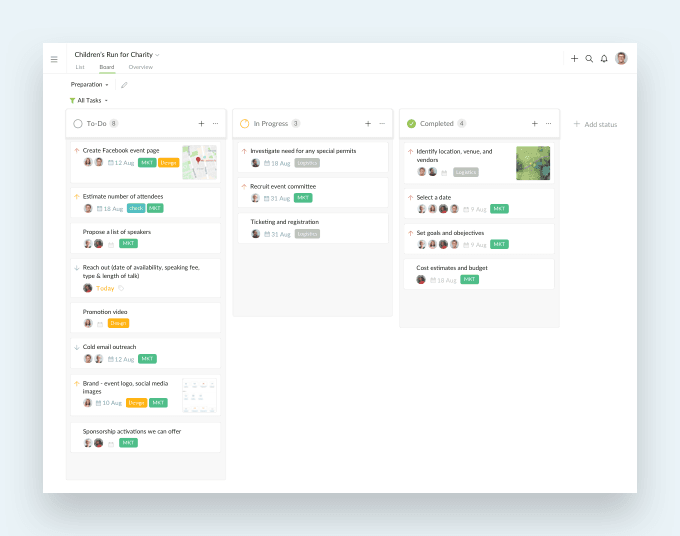 Tip: You could switch from Board view to Task list view for getting a big picture of your whole project. Create Your Own Board Now! That's all we have to talk about Kanban board for now. Go ahead and have fun! Let's get started in Quire today!